What do a small group of fish and shrimp farmers purchasing feed together have in common with a classroom full of high school students who share the work of a successful 200+ acre livestock and grain farm? What do a group of small-scale vegetable growers collectively marketing produce have in common with a barista-owned coffee shop? At the CFAES Center for Cooperatives, we like to say, “If you’ve seen one co-op, you’ve seen one co-op,” a mantra that certainly seems to describe our work in 2018. Over the last year, the Center’s team supported cooperative development efforts across Ohio and West Virginia in a variety of areas. Team members helped aquaculture producers develop a business plan for cooperative purchasing, an effort to make their farms more efficient and sustainable. They helped growers in Mansfield and Moorefield – Ohio and West Virginia, respectively – learn about the cooperative business model and develop market assessment tools to evaluate how they could use a co-op to access new market channels. They led the completion of a multi-organizational feasibility study for a cooperative in the forest and wood products industry. And they helped link veterans developing a farmer-veteran training program to resources in OSU Extension and the U.S. Department of Agriculture. These efforts were made possible by funding from the U.S. Department of Agriculture’s Rural Cooperative Development Grant program, which will continue in 2019, supporting the Center’s efforts to strengthen rural economies through cooperative development. 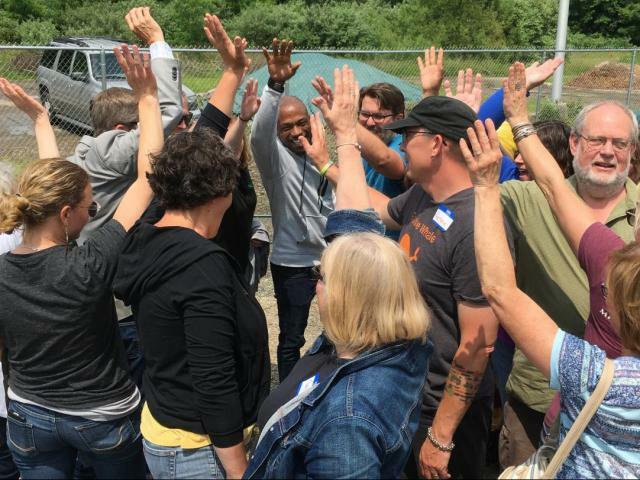 The Center will focus on cooperative development in food and agriculture, forestry, rural connectivity, and worker-ownership in 2019. The Center will also continue efforts to educate various audiences about the cooperative business model, building on successes launched in 2018. In June 2018, the Center launched Co-op Mastery: Beyond Cooperatives 101, an innovative online training course and companion workbook designed to educate cooperative members, boards, management, employees, and students. Co-op Mastery’s curriculum focuses on mid-level knowledge about the cooperative business model, providing an in-depth look at governance, finance, taxation, and other areas. Ivory Harlow, a program specialist with the Center, received the OSU CFAES Staff Advisory Council’s 2018 Key Values Award in the area of Innovation for her work developing Co-op Mastery. The Center also brought cooperative education to a variety of stakeholders through workshops and seminars in 2018, sponsoring the seminar, “Agricultural Data Coalition: Putting Farmers in the Driver’s Seat,” and co-sponsoring, “Co-op Law & Practice CLE,” in partnership with the University of Dayton School of Law and Advocates for Basic Legal Equity, Inc. (ABLE). Center team members taught cooperative workshops at conferences around the region and nationally, including the 2018 Association of Cooperative Educators Annual Institute and Building Wealth through Worker-Ownership in partnership with the Ohio Employee Ownership Center at Kent State University and the Appalachian Center for Economic Networks (ACENet). Center team members are looking forward to leading sessions at the National Council of Farmer Cooperatives 2019 Annual Meeting, the 15th Annual West Virginia Small Farm Conference, and the Ohio Small Farm Conference in 2019, among many others. Connect with the Center for Cooperatives on Facebook (@OhioStateCooperatives), Twitter (@OSUCooperatives), and the Collaboration Nation blog (u.osu.edu/osucooperatives). Visit the Center’s website at go.osu.edu/cooperatives and contact the Center at osucooperatives@osu.edu or 740-289-2071 ext. 111.